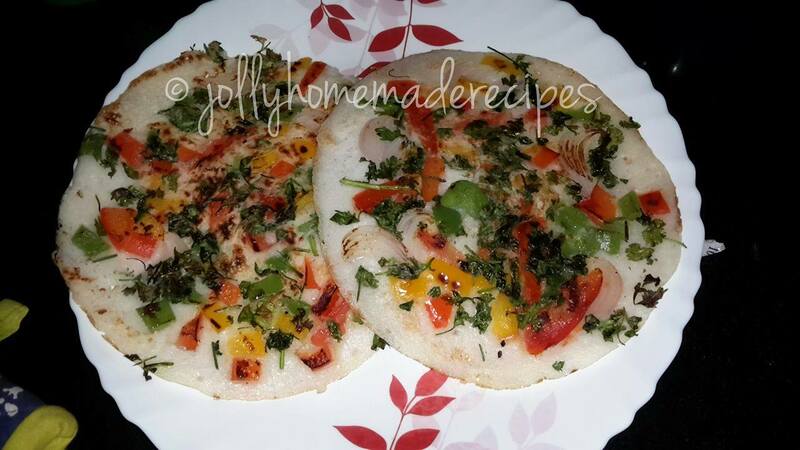 Mixed Vegetable Uttappam Recipe – Popular south indian breakfast snack. 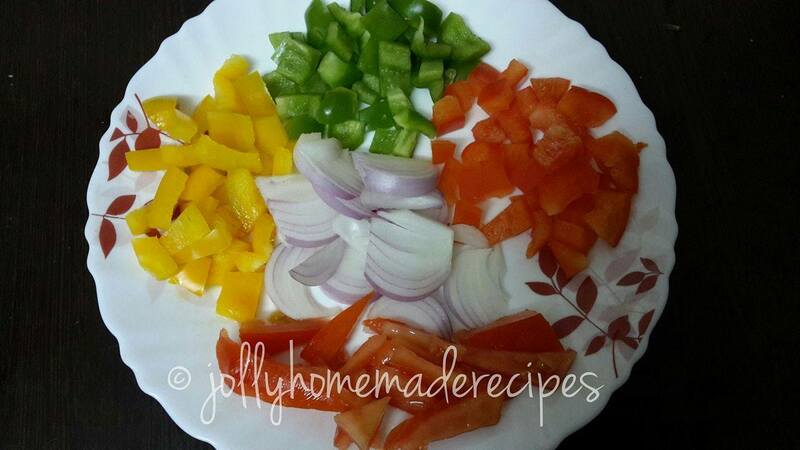 It's healthy as well as easy to make and can also be packed as tiffin snacks for kids. I usually make uttappams with the leftover idli or dosa batter. 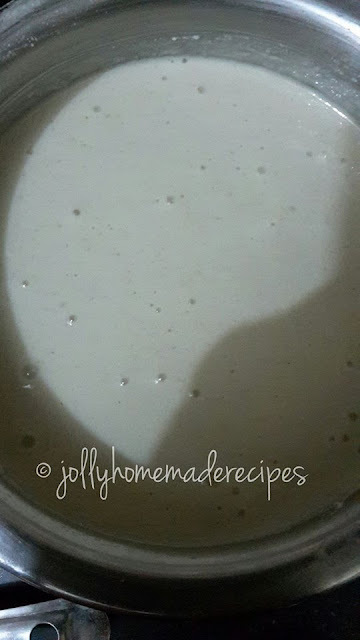 Personally I like southindian food, so I made this time dosa batter for uttappam...love masala dosa, idli and varieties of uttapam and mixed veggie uttappam is one of them. 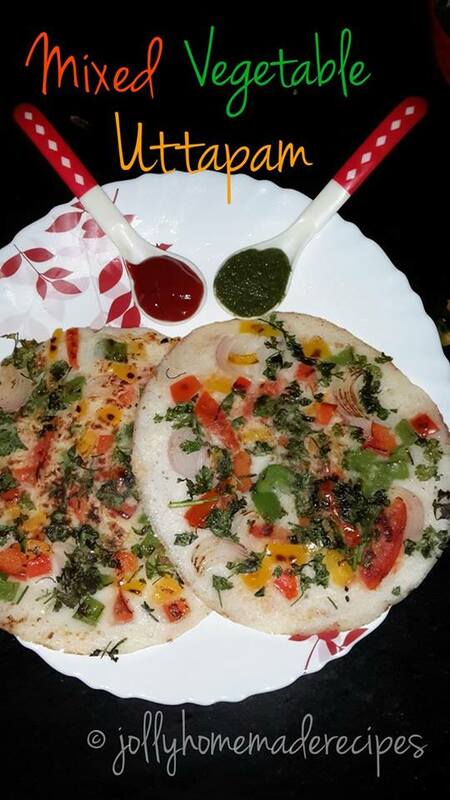 This Mixed Vegetable Uttapam is more colorful which makes it look beautiful on the plate and very tasty. The main difference between uttappams and dosas is that uttappams are slightly thicker than dosas and sometimes if you don’t cook them well then the insides will be little uncooked. It’s a really good option for breakfast or evening snacks. It's very light, yummy in taste and they are healthy like most south indian food. 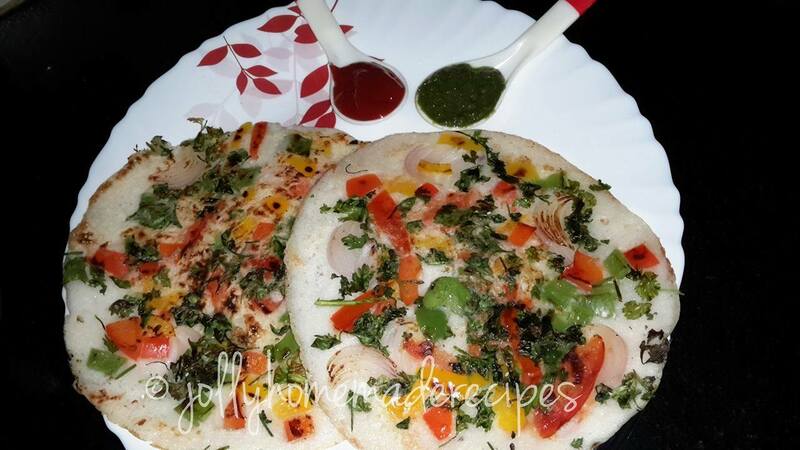 I love to eat uttappam in any form with the coriander chutney, sweet n spicy tomato-onion chutney or with tangy sambar. 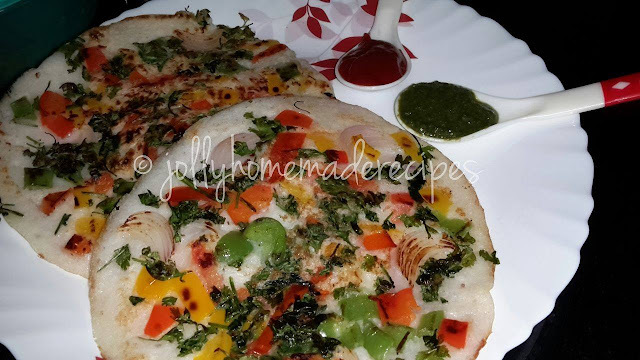 Let's start to make this easy and quick recipe of mixed vegetable uttappam with simple step-by-step process with photos. 1. 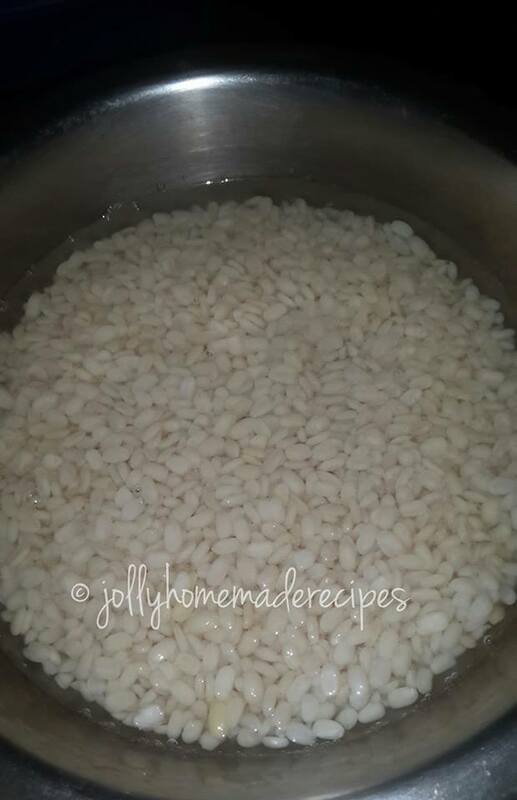 Clean and wash the rice, poha and urad dal separately. Soak them in the water for 2-3 hours. Drain the water from the rice, poha and dal. 2. 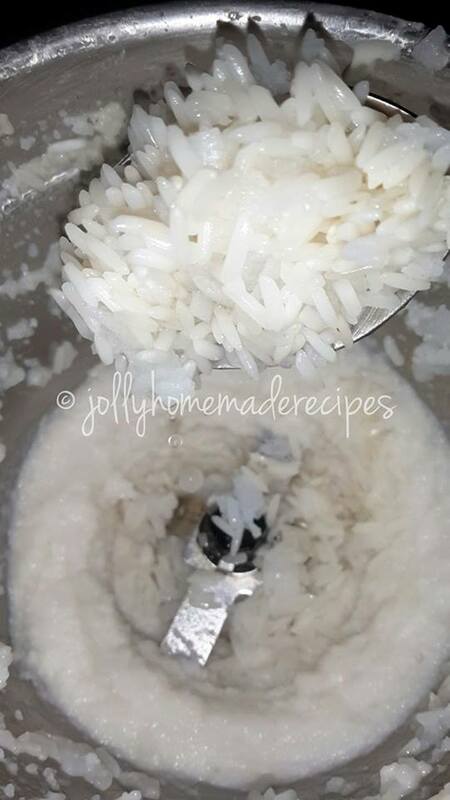 Take the soaked rice and poha in a grinder and grind it to make a fine paste. Take out the ground rice in a wok. 3. 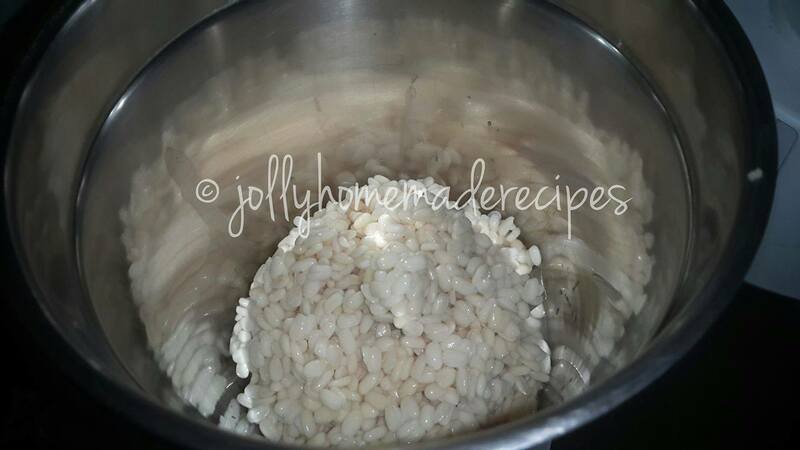 Then, take the urad dal in the grinder and grind it to make a fine paste. 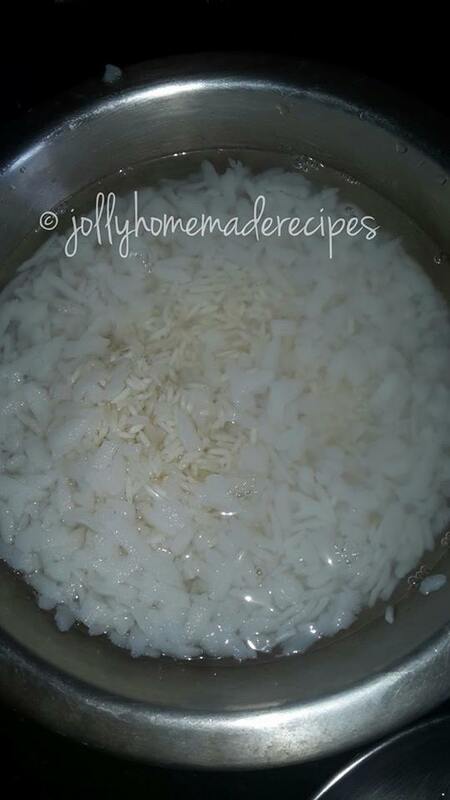 Add ground dal in the bowl(in which you have put the ground rice). 4. Cover and keep it aside for 6-8 hours or overnight for the fermentation. 5. 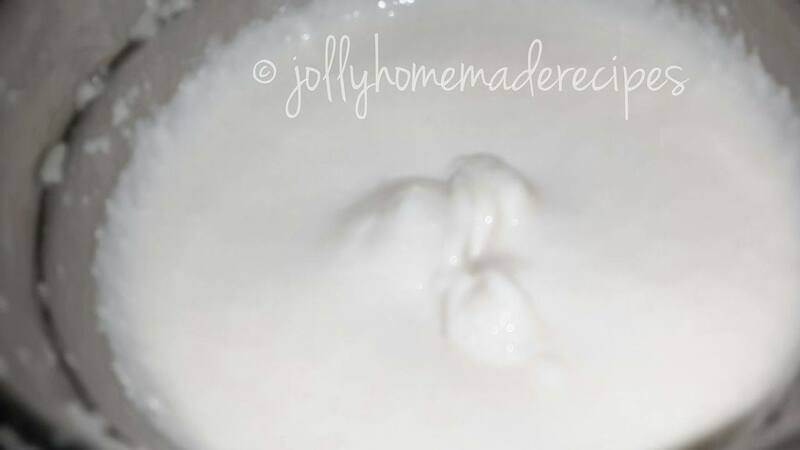 Add 1/2 cup water in the bowl and add salt and pepper...mix it well. 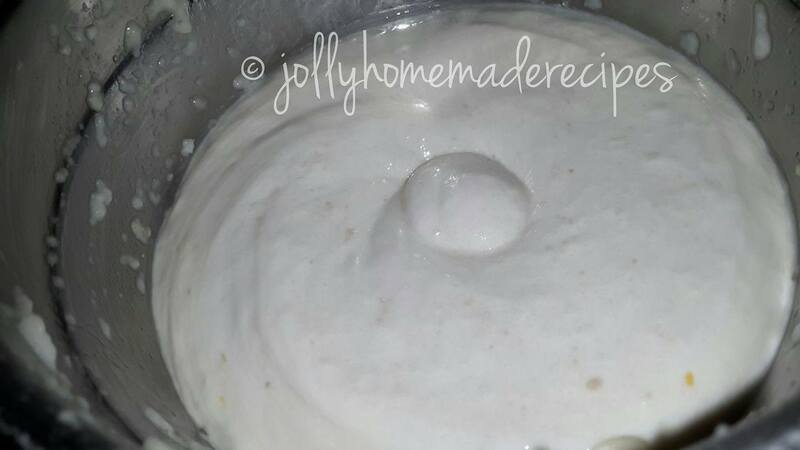 The consistency of the batter should be spreading like the dosa batter. 7. 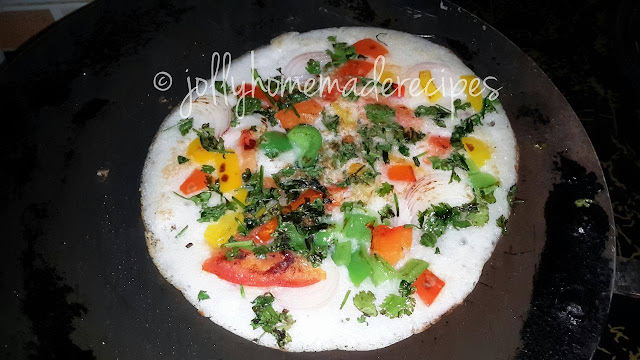 Top the uttappam with the above topping ingredients. 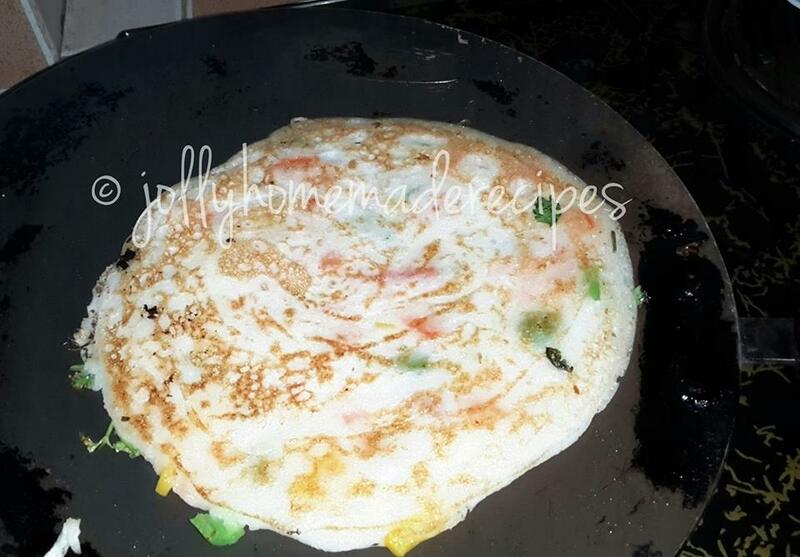 Add some oil on the sides and top of the uttappam. 8. 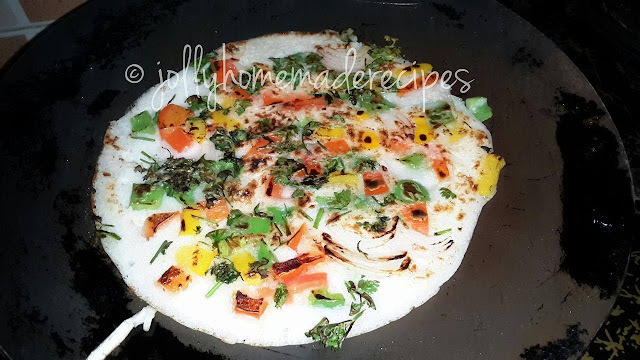 Turn the uttappam when the base is cooked. Apply some oil on the cooked side. The topping side is getting cooked now. flip when this side also gets cooked. 8. Flip again if you see the first side is not cooked or browned. 9. 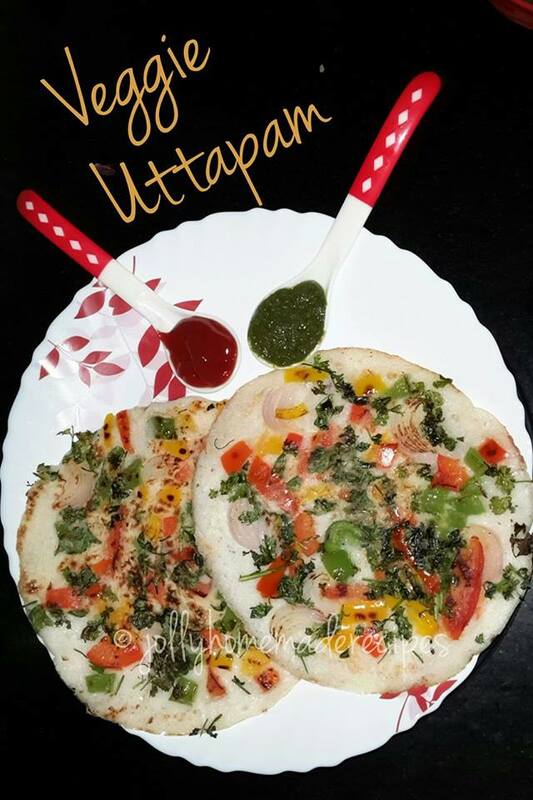 When the uttappams are crisp and cooked on both sides, uttappam is ready to serve. Serve uttappam hot to have best taste. 10. Serve the uttappams with tomato chutney and coriander chutney. You could also serve uttappams with hot with hot sambar, coconut chutney. 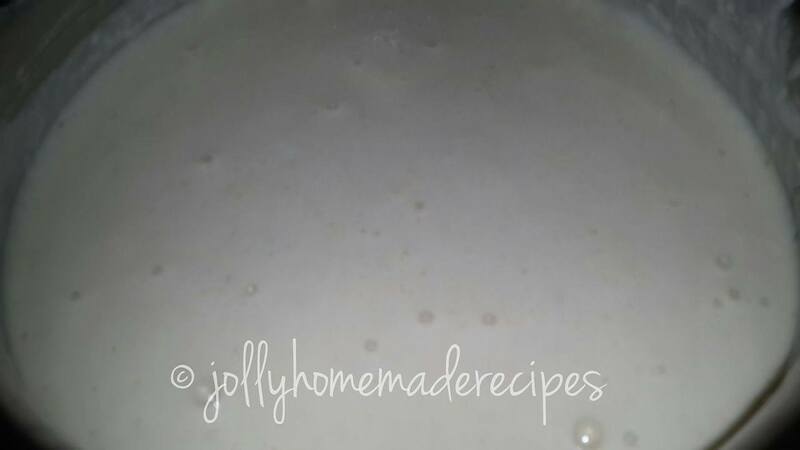 Love uttappams, and they look super yummy and packed full of nutrients. Awesome share my dear! Thank you so much my friend Anu! My all time favorite. Healthy and YUMMY! Thanks a lot dear Kushi! This is my ultimate breakfast. i just cant describe how much i love uttappams.